DUBAI, U.A.E, 12 Oct 2015 – Emirates has launched a new set of amenity kits for its First and Business Class customers. The bags have been designed in close collaboration with luxury Italian brand Bvlgari and are already available onboard all flights. The Emirates Private Collection by Bvlgari for First Class customers will have eight designs for men and women. The Emirates Indulgence by Bvlgari for Business Class customers will feature another eight designs for both men and women. The set of 16 designer kit bags will be refreshed every nine months giving frequent travellers something new to look forward to on their flights. “We’re pleased to be able to bring even more options to our customers with the revamped kits. We put emphasis on the details of our products to match the comfort and luxury of travelling on Emirates. Bvlgari and our team worked very closely on the designs to develop bags that were stylish without compromising on functionality,” explained Terry Daly, Emirates’ Divisional Senior Vice President, Service Delivery. The variations will be available on different sectors giving passengers travelling on connecting flights a chance to collect all four bags. The new kits feature bespoke designs for men and women inspired by Bvlgari’s latest collection. The men’s First Class bags are made of leather for a premium feel while the ladies’ bags for both First and Business Class come in a satin finish. Each kit contains Italian-made Bvlgari products exclusive to Emirates including body lotion and the brand’s signature Red Tea miniature spray. The men’s kits also include a Bvlgari After Shave Balm, while the women will receive the Bvlgari Nourishing Face Emulsion amongst other travel essentials. A new fragrance will be introduced with each set, beginning with Bvlgari Red Tea. In the coming collections, Black Tea, White Tea and Green Tea fragrances will be launched to represent colours of the United Arab Emirates flag. The new amenity kits in premium cabins are among the first of several product updates being planned. 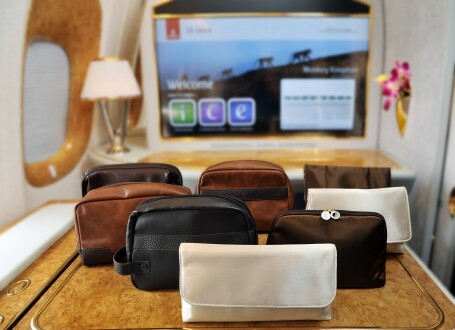 As part of its commitment to continuous product development and an exceptional travel experience, Emirates will also be launching a new collection of amenity kits for Economy Class in the coming months.